The 3D printer that will be launched to the space station in fall 2014 is tested at NASA’s Marshall Space Flight Center. NASA, in conjunction with the American Society of Mechanical Engineers Foundation, has issued “Future Engineers” printing challenges for the first 3D printer aboard the International Space Station. Middle and high school students will design items for 3D printing on ISS, and the winning student will watch from NASA’s Payload Operations Center with the mission control team as the item is printed in space. NASA and the ASME Foundation will also promote these projects and others in Maker Community Challenge Showcases, in which student participants would have the opportunity to have their 3D designs printed at local Maker community locations and student participants would showcase their 3D designs in on online open hardware design repository. A 3-D printer intended for the International Space Station has passed its NASA certifications with flying colors—earning the device a trip to space sooner than expected. The next Dragon spacecraft, scheduled to launch in August, will carry the Made In Space printer on board. “Passing the final tests and shipping the hardware are significant milestones, but they ultimately lead to an even more meaningful one – the capability for anyone on Earth to have the option of printing objects on the ISS. This is unprecedented access to space,” stated Made In Space CEO Aaron Kemmer. 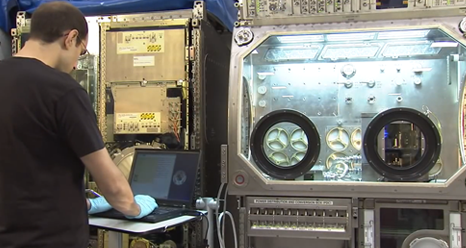 This 3-D printer will be the first to be used in orbit. Officials have already printed out several items on the ground to serve as a kind of “ground truth” to see how well the device works when it is installed on the space station. It will be put into a “science glovebox” on the International Space Station and print out 21 demonstration parts, such as tools. “The next phase will serve to demonstrate utilization of meaningful parts such as crew tools, payload ancillary hardware, and potential commercial applications such as cubesat components,” Made In Space added in a statement. Once fully functional, the 3-D printer is supposed to reduce the need to ship parts from Earth when they break. This will save a lot of time, not to mention launch costs, the company said. It could also allow astronauts to manufacture new tools on the fly when “unforeseen situations” arise in orbit. Another NASA 3-D printer contract, given to the Systems & Materials Research Cooperation, could lead to a device to manufacture food for crew members. A NASA study has recently concluded that the “Cannae Drive,” a disruptive new method of space propulsion, can produce small amounts of thrust without the use of propellant, in apparent discordance with Newton’s third law. According to its inventor, the device can harness microwave radiation inside a resonator, turning electricity into a net thrust. If further verified and perfected, the advance could revolutionize the space industry, dramatically cutting costs for both missions in deep space and satellites in Earth orbit. The basic principle behind space propulsion is very simple: for every action, there is an equal and opposite reaction. Use a rocket engine to throw mass one way, get propelled the other way. And according to the law of conservation of momentum, the more mass you throw behind you and the faster you throw it, the stronger your forward thrust will be. One consequence for space travel is that, to counter Earth’s gravity and reach orbital velocity, rockets need to carry a very large amount of propellant: For instance, in the now-retired Space Shuttle, the mass of the fuel was almost twenty times greater than the payload itself. In satellites the impact is smaller, but still very significant: for geostationary satellites, fuel can make up as much as half the launch weight, and that makes them more expensive to launch and operate. But now, a NASA study has concluded that a new type of spacecraft propulsion is able to generate thrust without propellant. This appears to violate the law of conservation of momentum: in other words, if no mass (fuel or otherwise) is being ejected from the system, where is the thrust coming from? Where is the equal and opposite reaction? According to its inventor, US scientist Guido Fetta, the thruster works as a resonating cavity for microwave radiation. The cavity redirects the radiation pressure to create an unbalanced force, and that force produces a net thrust. In its study NASA didn’t attempt to explain the phenomenon, and instead contented itself with verifying that the system did indeed generate a small amount of thrust, between 30 and 50 micro-Newtons. This is a tiny amount, only enough to levitate a mass of three to five milligrams (a few eyelashes) here on Earth; but, astonishingly, it is a net thrust nonetheless. “Test results indicate that the RF resonant cavity thruster design, which is unique as an electric propulsion device, is producing a force that is not attributable to any classical electromagnetic phenomenon and therefore is potentially demonstrating an interaction with the quantum vacuum virtual plasma,” the study concludes. The system has many striking similarities with the EmDrive, designed by British aerospace engineer Roger Shawyer, although the explanation that Shawyer provides for the working mechanism is quite different from Fetta’s or NASA’s. According to Shawyer, the thruster works because of relativistic effects: the microwaves are moving at a significant fraction of the speed of light at both ends of the resonator, and so, he claims, the resonator and the microwaves have two separate frames of reference, with the two forming an open system that ultimately doesn’t violate the laws of physics, conservation of momentum included. The interesting thing about EmDrive is that, back in 2009, a Chinese peer-reviewed journal tested Shawyer’s thruster design, registering 720 mN of thrust at an input power of 2.5 kW. That’s enough to make a tennis ball hover, and then some; in fact, if the results are confirmed, such levels of thrust would already be practical for satellitar applications. The system could generate electricity from solar panels, and because it is much lighter than current thrusters, it could more than halve the weight launch of satellites, leading to very significant reductions in launch costs. A practical microwave thruster could also meaningfully extend the lifetime of satellites and pave the way for deep space robotic missions. But before we start talking Sun-powered flying cars and weekend trips to Pluto, the scientific community will undoubtedly need to dissect the experiment with great care and independently verify whether the tiny net thrust reported by NASA could after all be attributed to some external cause that the researchers didn’t account for.